Boiled greens, or Horta vrasta (HOR-tah vrah-STAH), are a staple in any Greek household. They are easy to prepare and when dressed with a bit of olive oil and lemon, you will really enjoy the clean, pure taste. 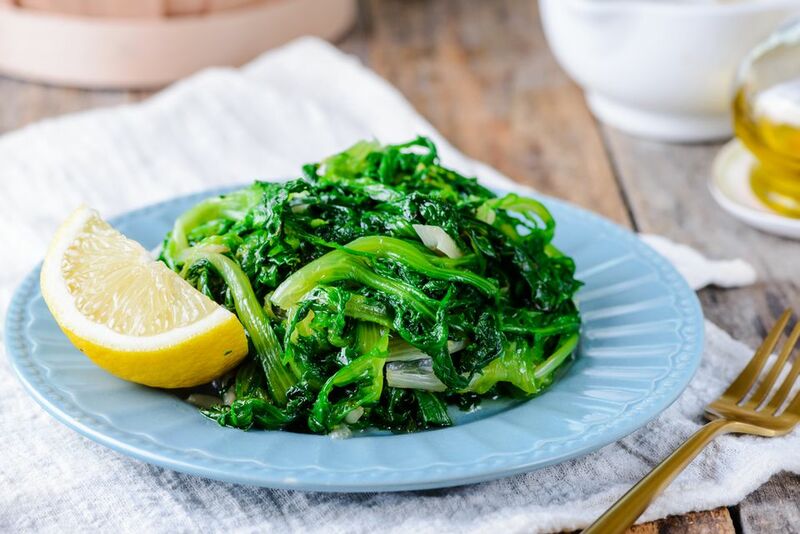 Like spinach, boiled greens wilt and reduce when cooked to a fraction of their original quantity. So, it may seem like quite a lot, but for four ample servings, you will need approximately three pounds of greens. This recipe calls for curly endive, which is often confused with chicory (because they are cousins) but both are good in this dish so don't worry if you buy one instead of the other. You will find endive sold as a head, sort of in the shape of a heart, with an off-white center surrounded by lacy, green leaves that curl at the end. It has a pleasantly bitter taste. Wash the greens well before cooking and trim any coarse stems. Discard any brown leaves. Soak the greens in a clean sink with plenty of water and about a cup of white vinegar. Any sand or residue will fall to the bottom of the sink while the greens will float on top. Remove the greens to a colander before draining the water. Bring a large pot of water to a boil and then add about a tablespoon of salt to the water. Carefully submerge the greens in the pot and boil for about 20 minutes or until the thickest parts of the stems are tender. Be careful not to over boil. Drain in a colander and place in a bowl. Dress with extra virgin olive oil, lemon juice, and a bit of salt and pepper to taste. You can serve the greens warm or at room temperature.